Rt. Rev. Augustine Chijioke was born on 30th March 1960 atOnitsha in Anambra State. He is the first son and second child, out of nine children, born to Late Mr. Titus Chikwendu Aneke and Mrs. Alice Izukanchi Aneke (Nee Onyia) of AkaagbaniUmunugwoObioma in UdiL.GA, Enugu State. Both Kindergarten and Primary School began for Chijioke at St. Andrew's Church Primary School, Odakpu Onitsha. At the outbreak of the Nigeria/Biafra Civil War, Academic pursuit was punctuated at Primary Two.In 1970, the young Chijioke continued his Primary school at St. Luke's Church Primary School Ogui, Enugu. He obtained the First School Leaving Certificate in 1974 and in the same year gained Admission into Christ High School Abor in Udi L.G.A., where in 1979 he got his West African Schools Certificate, between September 1979 and 1980, he served as an Auxiliary Teacher at the then Boys High School, Obioma. In pursuit of High Education he gained Admission into the prestigious Institute of Management and Technology in 1980 to study Business Administration and Management. In 1988, he acquired HND in thesaid discipline. By the grace of God, on the 4th July 1993, he was made a Deacon and on 10th July, 1994 was priested by the first Bishop of Enugu Diocese, Rt. Rev. G. N. Otubelu. In 1997, the same Bishop G. N. Otubelu instituted him a Parish Superintendent. Thus, Rev. Chijioke became the first Parish Superintendent of St. James Church Parish Iva Valley. The year 2003 was significant in life and ministry of Chijioke and his family. On 21st March 2003, our ministry moved from Enugu Diocese to Oji River Diocese where it was needed most. This happened after due process, mutual agreement and proper release. In 2005 during the Synod at St. John's Church ObinofiaNdi-Uno, his Lordship, Rt, Rev. Dr. Amos A. Madu preferred him a Canon of the Cathedral. And barely one year after, the Bishop also appointed him an Archdeacon on 28th May 2006 at the Synod at Christ Church, Achi. The preferment was a Wedding Anniversary Gift though unknown to his Lordship. St. Matthew'sChurchAmechiAwkunanaw- Church Teacher, January 1989 - June 1989. St. Michael's Church Ihe-Awgu- Church Teacher, June 1989 - August 1990. All Saints Church G.R.A. Enugu - Curate, 1993-1996. Emmanuel's Church, Enugu AguAchi - Superintendent, 2003-2007. He was elected Bishop by Church of Nigeria House of Bishops in Lagos Mainland Diocese on November 12, 2008. On January 11, 2009 they were consecrated Bishops (thirteen of them) at All Saints Cathedral Church Ughelli in Delta State, Nigeria. 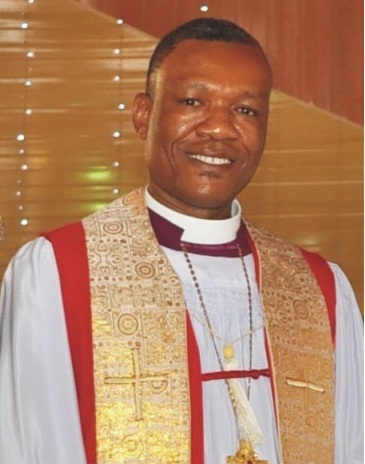 On January 14, 2009 before hilarious worshippers from far and near, Bishop Chijioke was enthroned and installed the first Bishop of the Diocese of Udi. In attendance were twenty-five Bishops led by the then Archbishop, Metropolitan and Primate of all Nigeria, the Most Rev. Peter J. Akinola at the Cathedral Church of Emmanuel Umuabi. Rt. Rev. Chijioke Aneke is married, he got wedded to his amiable wife, Mrs. Comfort Aneke (Nee Agbo) on 28th May 1994 at All Saints Church, G.R.A. Enugu by Rt. Rev. G. N. Otubelu. They are blessed with four children: Titus Junior, Ngozi, Amarachukwu and Eberechineke. To God be the Glory. +Rt. Rev. Chijioke A. Aneke. Bishop of Diocese of Udi.